FX series PLC 2 step instructions there are two: stepping contact instructions step and STL RET return instructions. Significance of STL instructions to activate a State. Reflected in the ladder diagram from the bus status led on points. STL function of instruction established a bus, so that the State of all the child on the bus. Step contact instructions in the ladder diagram is shown in Figure 5 below. RET instruction is used to return to the main bus bars. When completion of step–sequencer, non-State programs completed in the main bus, to avoid logic errors. Transfer the RET instruction must be used at the end of the program. This entry was posted in plc program and tagged PLC ladder, PLC ladder diagram, PLC programming on June 13, 2016 by arco. 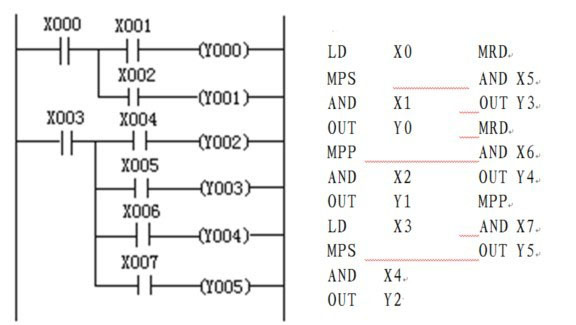 INV (Inverse) instruction in the ladder diagram with a 45 ° short slashes to represent, it will perform the calculation result be negated before the instruction, and the result is 0 it becomes 1, and the result was 1 becomes 0. In the following diagram, if X0 and X1 both ON, Y0 is OFF; otherwise, Y0 is ON. INV instructions can also be used for pulse LDP,LDF,ANDP contact instructions. Handheld programmer type INV command, first by NOP keys, and then press the P/I key. NOP (Non processing) for no operation, and the sequence for air operations. When you do finish clear user memory user memory contents become no operation. END (End) to end the directive, will be forced to end the current scanning implementation process. If not END command, from the user‘s first step to the last step of the program memory; END end of Instruction in a program, perform the first step to END this program in one step, use the END command scan period can be shortened. When in the debugger, you can insert the END directive in the wake of the program, starting from the first paragraph sub-paragraph debugging, debugging must be deleted after the program END in the middle of instructions, error–checking program in this way is also very useful. This entry was posted in plc program and tagged plc courses, PLC ladder, PLC ladder diagram, PLC programming, plc programming examples on June 12, 2016 by arco. Simply put, PLC is a programmable logic controller, the most used, the simplest way of programming is the ladder diagram, so even if you don’t have a program that can be. PLC function can replace traditional relay realize automatic control. More knowledge, I suggest you look at this Web site, you will be rewarding. This entry was posted in plc program and tagged PLC programming on June 4, 2016 by arco. (1) if the PLC with program, should learn more about the program features and level of satisfaction of needs and modifiability. Using PLC comes with program as far as possible. (2) all PLC related to the input signal (button, switch, speed, and temperature sensor), the output signal (contactors, solenoid valves, lights, etc) list respectively, and PLC interface within range determined for each signal is assigned a number. (3) detailed knowledge of production process and equipment requirements for control systems. Draw the various functions of the system of work circulating diagram or flow chart, functional diagrams and related signal timing diagram. 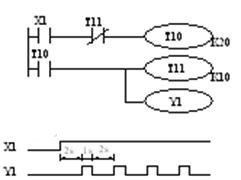 (4) in accordance with the requirements of PLC programming language design ladder diagram or writing programs. Ladder diagram symbols should be on scene signal with CRT PLC internal interface provides annotations. (1) ensure the safety of persons and equipment design is never superfluous. (2) Safety design of PLC program, doesn’t mean the hardware protection can be omitted. (3) understanding characteristics of the PLC. (4) design transfer pilot is easy to debug. (6) to minimize the program. (7) comprehensive comments, easy to repair. This entry was posted in plc program and tagged PLC programming on May 31, 2016 by arco. (1) input/output relays, auxiliary relays, timers, counters, the contacts of the device can be used repeatedly without complex programs to reduce the number of contacts. (3) in addition to stepping outside of any coil, timers, counters, advanced directives cannot be directly connected to the bus left. (4) in the program, do not allow the same number of coil output twice (double coil output). (5) the bridge circuit is not allowed. (6) the program sequence should be top down, written from left to right. In order to reduce the number of program execution steps, procedures should be left to the right small large small. In the traditional relay–contactor control and PLC on the basis of typical control circuit, based on accumulated experience to translate, modify and improve, and get the final program. Programs at the start of monitoring program the machine to scan input each signal on all input ports, and in turn into the corresponding input mapping registers. All input ports sampled after the logical operation begins, based on user input controls, starting from the first article, article-by-article implementation and the corresponding logical result, deposit corresponding to the intermediate element and output element mapping registers, when finally a program‘s execution has been completed, becomes the output refresh processing. Output the contents of element mapping registers, starting from the first output port, to the last end, read in turn corresponds to the output latch, which will drive the output devices to form actual output may be programmed. In General, the PLC scanning cycle is about 10ms, in addition, programmable logic controller input/output and response lag (about 10ms input filter), relays mechanical delay of about 10ms, so a signal from input to output, the lag of approximately 20–30ms. Effective width should be greater than 1 cycle of the input signal +10ms. This entry was posted in plc program and tagged PLC programming on May 29, 2016 by arco. Ladder diagram programming languages are ladder diagram symbols to describe a programming language to program. Ladder diagram programming language used, the program takes the form of ladder diagram description. This programming language conditions of causation is used to describe events and results. Each step is a causal relationship. In cascade, and describes the conditions that the event occurred on the left, behind the incident results in. Ladder diagram programming language is the most commonly used programming languages. It comes from a relay logic control system description. In the field of industrial process control, electrical technicians are familiar with relay logic control technology is, therefore, by this logic control technology development of ladder were welcome, and a wide range of applications. (4) one by one with the Boolean mnemonic programming language relationship, facilitate mutual conversions and process checks. Boolean mnemonic programming languages are using Boolean mnemonic to describe a programming language to program. Boolean mnemonic Assembly language is very similar to programming languages and computer, used to express Boolean mnemonic function. (3) corresponding to the ladder one by one. Its basic characteristics and ladder diagram language is similar. (4) only performed step commands and actions are, scan conversion to the active step, thus, the entire program to scan other programs program scanning time significantly shorter. Function diagram from Petri, Laurentius (Petri) network, because of its graphical expression, can be relatively simple and clear description of concurrent systems all phenomena and complex systems, and system deadlocks, insecurity and other anomalous phenomena analysis and modeling, models can be programmed directly on the basis of, so, get pan application. In recent years, the introduction of programmable controllers and small distributed control system also provides the function diagram is used to describe programming language software. Petri, Laurentius (Petri) some basic concepts of network, when I will have the opportunity to introduce to members to help further understanding of the function diagram. (4) because each function module requires a certain amount of program memory, perform on the function module requires a certain amount of time, so the design language in large and medium sized programmable controller and distributed control system has been introduced only in the programming and configuration. Describes the programming language is a structured statement using a structured description of the phrase to describe a programming language to program. It is a programming language similar to the high-level language. Large programmable logic controller systems, structured statements describing the programming language is often used to describe the relationship between variables in the control system. It is also used for programming and configuration of distributed control systems. Description of structured statements describe computer programming language statements to describe the system in a variety of various operations relationships between variables, function or operation that you want to complete. Most manufacturers use the statement describing the programming language BASIC language, high-level languages such as PASCAL or c language is similar, but for ease of application, in the statement expression and statement types are simplified. (2) the need to have some computer programming skills and knowledge of a high-level programming language, the programmer‘s high skill requirements, General Electric technician could not be completed. (4) often used in both modules, some of the other languages, such as implementation of the control functions. Part of the programmable controller‘s manufacturer provides a simple structured programming languages, like a mnemonic programming language for the program, certain restrictions on the number, at the same time, provides the programmable logic controller interface or presentation of the communication connector and provides extension for user‘s application. This entry was posted in plc program and tagged PLC programming on May 28, 2016 by arco. This entry was posted in plc program and tagged PLC programming, plc programming examples on May 17, 2014 by arco.